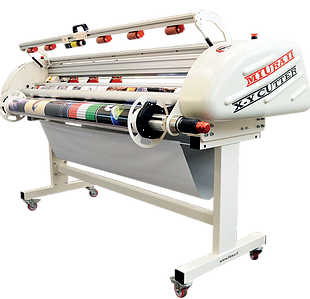 MIURA II is a automatic cutting/trimming machine with rotary blades in both X&Y direction that is capable of cutting flexible materials ranging from laminated graphics, PVC films, Scrim banner, polyesters, polycarbonates, reflective films, magnetic, wall paper, and various types of fabrics. Equipped with self sharping circular blades, the Miura II allows you to cut rolls or sheet goods without hesitation. This blade is mounted on a sturdy precision carriage assembly mounted on a linear recirculating ball guide ensuring maximum precision and long-lasting performace along with the ability to adjust your lengthwise cutting adjustments for repeated and continuous roll finishing. The operation of the MIURA II has 3 modes; Manual, Automatic, and Crop Mark. Each mode with specific abilities allows users to run in the most efficient way for their production. Rock Hill and Flexa are committed to developing, improving and upgrading the various products in a constant search for the best quality, the highest levels of reliability and the most efficient ways of post print trimming and finishing.